Say cheers! 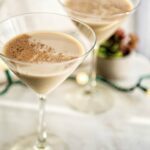 It’s another classic holiday cocktail, the Baileys Pumpkin Vanilla Silk Martini. Pour in the Baileys Pumpkin Spice, Vanilla Crown Royal, Amaretto, and cream. Garish with a sprinkle of cinnamon.